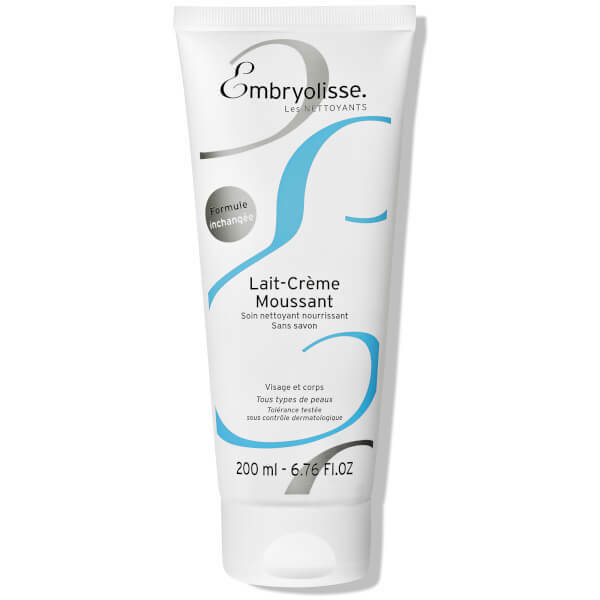 Experience cleansing luxury with Embryolisse Foaming Cream Milk, a moisturising, soap-free emulsion that works to cleanse and nourish even the driest, most sensitive of skin. With a rich and creamy texture derived from superfatty agents, the milky wash combines sweet almond oil with shea butter to gently and effectively soothe and clean your skin. Perfect for all skin types, the foaming milk will leave your skin feeling soft, supple and comfortable. - K.N. Massage in, then rinse off. Aqua, Caprylic/Capric Triglyceride, Sodium Trideceth Sulfate, Cetearyl Octanoate, Glycerin, Sodium Lauroamphoacetate, Oleic/Linoleic/Linolenic Polyglycerides, Polyquaternium 7, Coco Glucoside, Cocamide Mea, Sodium Chloride, Stryrene/Acrylate Copolymer, Butyrospermum Parkii, Prunus Amygdalus Dulcis, Citric Acid, Parfum, 1,2 Hexanediol, Caprylyl Glycol, Tropolone, Hydroxypropyl Guar, Methylisothiazolinone, 2-Hydroxyl 3-Trimethyl Amino Propyl Guar Gum Chloride.